Participating in Bend it like Buddha's program can be the first step in a life-changing journey of health and wellness. This program guarantees the best of the best teachers for this unique double certification training with a bonus of an eight hour Ayurveda massage therapy certification. Be inspired, meditate, learn, contemplate, take home a valuable gift of restored health, and learn in depth about the art of teaching yoga, meditation, pranayama, yogic lifestyle, and more! During this program, you will stay at the newly renovated Flor da Rocha Hotel in Portimao. All rooms are spacious, include in room fast Wi-Fi, daily housekeeping and towel service, a large flat screen, cable TV, air-conditioning, self-service kitchen, joining patio with table and chairs, concierge/security, a large swimming pool, lounge chairs, and a pool cafe. Bend it like Buddha offers 140 contact hours and the 60 remaining hours are allotted for study and reviewing course material during free time, preparing for assignments, and pre-reading handouts prior to the program start date. Preparing prior to the program by pre-reading the course material helps students retain information and encourages everyone to get the most out of the training. The last training held by Bend it like Buddha Yoga attracted students and teachers from 17 different countries. Reshy has assisted and also led several 200-hour yoga teacher training programs in India and Thailand for different schools. She has registered her yoga school, Yoga Space, with Yoga Alliance and offers 200-hour yoga teacher training in Hatha and Vinyasa flow yoga. Reshy trained in the discipline of yoga under two very experienced teachers, Sujata Nerurkar and Dr. Renu Mahtani at Param Yoga, in Pune, India, where she completed her foundation in Hatha yoga teacher training and medical yoga therapy in 2011. She trained further in Vinyasa yoga, prenatal yoga, science of pranayama, and Viniyoga. Tori Mitchell is an expert in Ashtanga Vinyasa and the founder and main instructor at Vibe Yoga, Taiwan. Her most recent background training is in the advanced teacher training in anatomy and adjustments with Arielle Nash at Centered Yoga in Koh Samui, Thailand. Tori Mitchell also studied Ashtanga Vinyasa with Manuel Ferreira, an authorized teacher from KPJAYI and also completed a two-week immersion with Iain Grysak in Ubud, Bali on pranayama, philosophy, and Ashtanga Vinyasa. She's trained in asana and pranayama in Mysore, India with the last living legend of Ashtanga, Guruji BNS Iyengar. This inspirational program is held at the gorgeous Praia da Rocha beach in Portimao. This area has inspired and has been chosen by several imminent yogis and well-known gurus to build ashrams and eco-communities in this region. As it is beautifully natural, peaceful and a refreshing place to restore your mind, body, and soul. 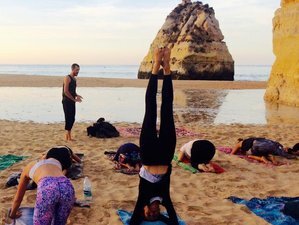 The accommodation venue, Flor da Rocha Hotel, is a five-minute walk from Praia da Rocha beach and a three-minute walk to yoga training venue at Bend it like Buddha Yoga studio. During the program, you will be served daily breakfast, lunch, and light dinner. The food concept is healthy, tasty, vegetarian, and organic. Savor juicy local fruit, crunchy organic vegetables, crisp salads, and fragrant herbs while sipping on an energizing juice or sweet, colorful herbal tea. Everything is freshly harvested and lovingly prepared with attention to detail in the on-site kitchen where you can cook your own meals if you prefer. There are diverse fusion recipes in a peaceful and tranquil setting. Bend it like Buddha Yoga believes that pleasing your palate is fundamental to your experience. If you are vegan, raw foodie, or gluten-free, it’s no problem. The resident chef can make something delicious for you. You can choose from fresh tropical fruit, homemade organic yogurt, a wide selection of vegetarian dishes (delicious even for those not used to vegetarian food), curry dhal, rice, salads, herbal teas, and chai. Throughout the day, you can order small snacks, vitamin, health-booster juices, and fresh local fruit for a small extra fee. You can also enjoy trying dinner out by visiting some of the delicious local restaurants nearby. There is a variety of restaurants that serve excellent Brazilian, Chinese, Portuguese, Japanese, German, Russian, Indian, Turkish, Italian, or English food. Bend it like Buddha is an RYS offering 200 and 300-hour training-retreats adjacent to stunning locations in Portugal, India, and Indonesia.